“There’s a river running sweat right through our land. Driven by a man with a bullwhip in his hand. In the days of black and white TVs, landline telephones, and vinyl LPs, authors of history books for children frequently took great liberties in their writing. They often created fictional dialogue, indulged in prejudice, marginalized women, and treated suppositions and possibilities as historic fact. As a kid in the 1960s, I read plenty of such “history” books. Back then, 99% of them were written about some famous white man who was duly placed upon a pedestal to be worshipped. Educated people and mainstream publishers have long since upended such nonsense. In the 21st century, we’ve come to expect more honest, accurate, and diverse history writing, in the same way that we’ve replaced antiquated gadgets with laptops, iPhones, digital TVs, and streaming music. 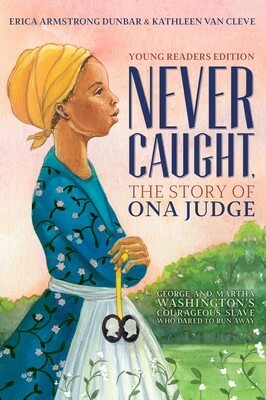 I thoroughly enjoyed NEVER CAUGHT, a captivating young reader’s edition of Dunbar and Van Cleeve’s 2017 book about Ona Judge, which was named a National Book Award finalist. In NEVER CAUGHT, the two educator-authors clearly delineate between what was and what might have been. This makes for a lot of “maybes” and “probablys” but it keeps the telling accurate and honest. In comparison to what is known about the “father” of our country and our first First Lady, there is far less information about their slave, Ona Judge. Nevertheless, the authors deliver an engaging tale by subtly weaving in vast amounts of factual information about slavery and the political tension over slavery that steadily escalated during the late 1700s and early 1800s. In the hands of these authors, this American history is crazy fascinating. For instance, we learn about the compromise by which it was decided that the new federal government would be located in a city to be built along the Potomac River. (It was eventually named Washington, D.C. after George’s death.) Meanwhile, the federal government was temporarily located in Philadelphia. Edmund Randolph, a Founding Father and America’s first Attorney General, screwed up big-time by not thoroughly understanding a 1780 Pennsylvania law. The law stated, “If an enslaved person was brought to Pennsylvania by a slave owner from another state, the enslaved person would be freed if they remained in Pennsylvania for longer than six months.” It turned out that three of Edmund Randolph’s slaves learned of and understood the law better than Washington’s Attorney General! Six months in Philadelphia went by, and the trio promptly claimed their freedom. Ha! So much for that nonsense that slaves were not capable of learning! Randolph went running to the Washingtons to warn them to avoid this trap. George and Martha then initiated a sly system under which their slaves were regularly shuttled in and out of Philadelphia, to repeatedly restart the six-month time clock and prevent them from gaining freedom. When Ona Judge was in her twenties, having faithfully served Martha Washington for more than a decade, Martha decided to give her to the Washingtons’ granddaughter as a wedding present. The granddaughter was a brat who Ona had known most of her life. This apparently was the last straw. Ona successfully escaped from the Washington household and from Philadelphia. Details about George Washington’s temper tantrum, willingness to trample on laws he had helped enact, and to plan a kidnapping in order to seek Ona’s quick return will further tarnish his reputation as a great American. Fortunately, a somewhat-hero intervened in the kidnapping scheme, Ona Judge was never caught, and she did not end up back in Mount Vernon being mercilessly punished for her escape. This is a triumphant tale that underscores the fact that, for all his arguable greatness, George Washington was a racist slave owner. Those Confederate flag lovers are going to hate this book.